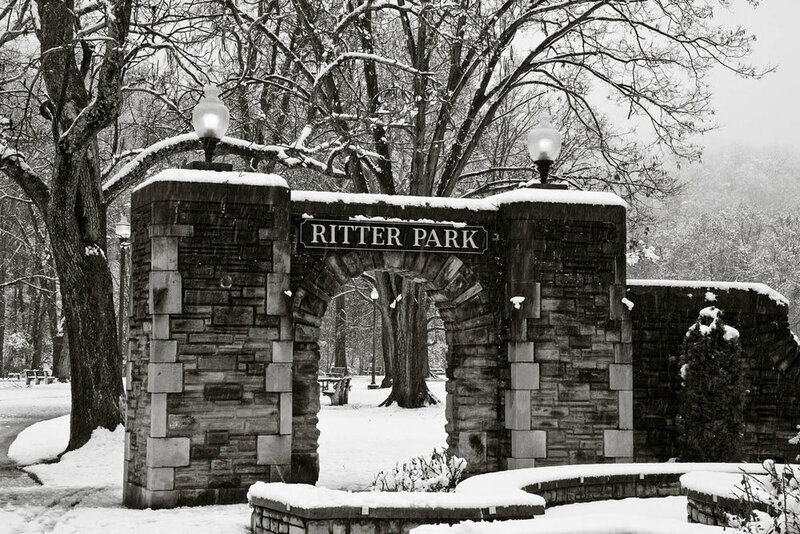 A quiet winter day in Ritter Park with hardly anyone else around is as good as photography gets in Huntington, WV. A winter storm that glanced through our area delivered 4 inches of heavy-wet snow and provided a wonderful photographic opportunity in Huntington. It also afforded me the first opportunity to test the camera protective bag I blogged about a few weeks ago. The protective bag worked very well in the wet snow conditions. I used the 24-105 zoom lens and had just a bit of difficulty retracting the zoom all the way to the 24mm zoom position and had to realign the sleave of the protective bag. It was a bit frustration at the short end of the zoom, but other than that the bag really performed well and kept the camera perfectly dry. All images were captured hand-held at ISO 400 with the bag in place the entire time. All images were optimized in Adobe Light Room 2.5 with only minor clone tools used in PS4. Enjoy the gallery and please let me know if you have any questions.